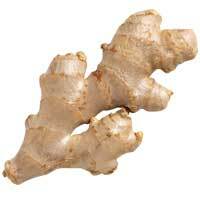 Fresh ginger is available year-round. Trim away the peel from 1-inch (25-mm) pieces. Mince with a sharp knife or use a fine grater. Grate fresh ginger over cooked veggies. Try sweet potatoes, carrots, or collard greens for an international flavor. Add ginger to olive oil, dried red chiles, cinnamon, cloves, bay leaves, and onions to create a delicious marinade.